For someone who has always trained for fast and flat, PB times and the love of tarmac, this report is truly something I never thought I’d write. 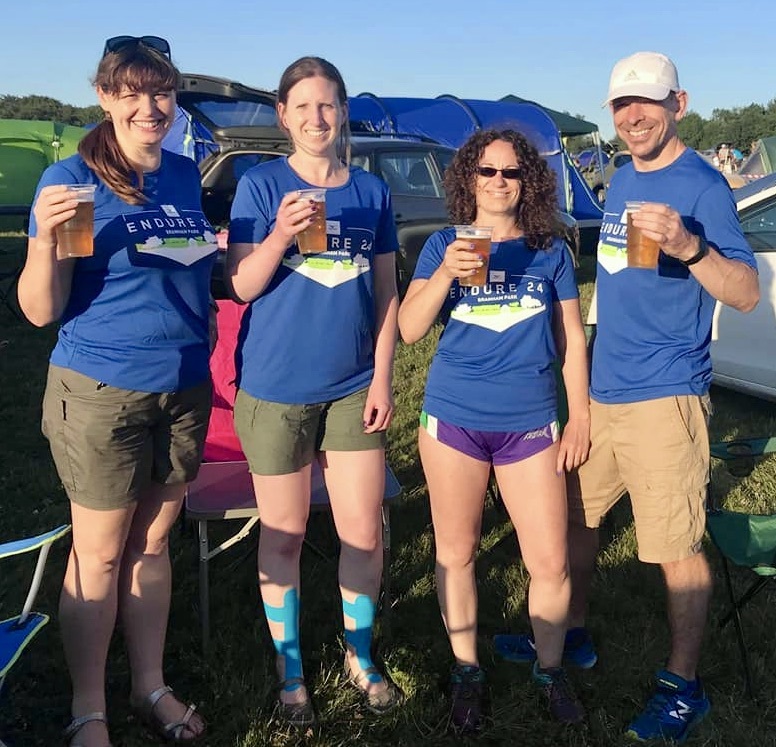 The blame/credit for this lies squarely at the feet of my amazing other half, Catherine Smith, and 2 super tough female Striders, Kerry and Anna. 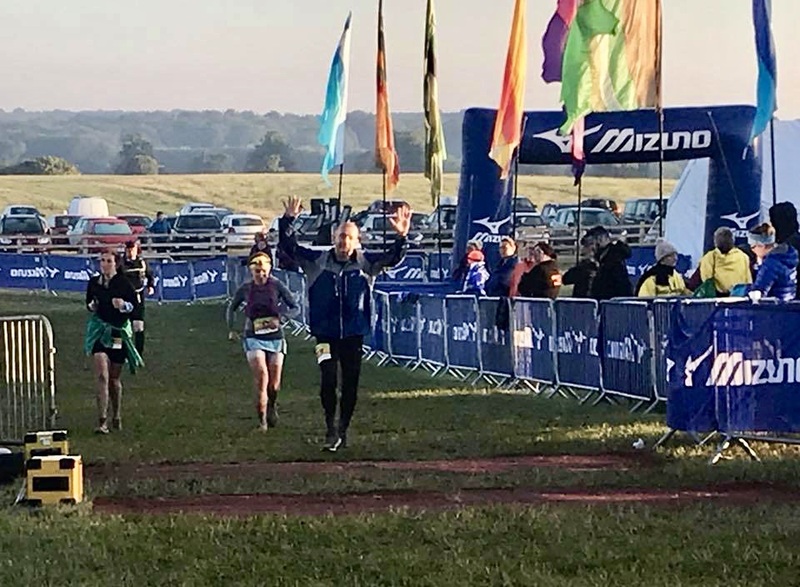 I had heard about crazy ultra running and been totally amazed for years about what people achieved, but none of it ever really seemed real or understandable. When someone said they just ran a 40, 60; 100-mile ultra it just did not compute to a roadrunner. I had no comparators. I know what 5k hard felt like and I had experienced the massive wall at 20 miles on a marathon. I had no idea what ultras would involve. What’s a good time for 50 miles? 100 miles? Everyone always told me you can’t do both. You run long, your speed will suffer. Say goodbye to racing the distances I love. Those were the thoughts running through my head when someone mentioned ultrarunning. My perspective now has certainly changed. 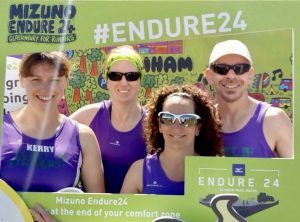 In June 2017 Leeds held their first Endure24 race and our very own Anna Seeley and Kerry Barnett both took part. Catherine and I decided to help them set up, giving us our first glimpse of the ultra world. Soon after we both signed up for the 2018 Endure24 Leeds event. 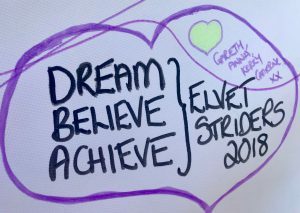 You have 24 hours to cover the greatest distance you can, run, walk, crawl or just endure till you can’t give any more. The race starts at midday Saturday and ends 24 hours later. It’s a tough mixed terrain 5 Mile lap, chip timed and supported. You can stop/start whenever you like until the cut-off and eat, sleep, change clothes, and shower. Your battle is against yourself, the ticking clock and your desire to achieve the impossible. My build-up to this was unconventional, to say the least; I am not an experienced distance runner in any way shape or form. My main goals were London marathon and Windermere marathon, so it was well into May until I even seriously considered Endure24 a goal/target to train for. 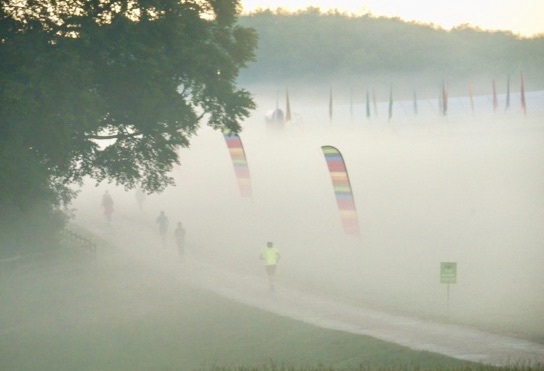 I’d run two 50k events as a test, earlier in the year, to see how I’d react. The first, 50k was way too fast and I’d suffered. The second was just over 4 hours and I absolutely loved it. I even managed a cool down 5k lap with Catherine after. Those 34 miles remained my distance PB right up to the day of Endure24. I’d always wondered if I could run 100 miles in a week; my normal weekly distance is about 30. This is very low for a marathon runner. I have always focused on quality rather than pure miles in my training. This works well with my lifestyle commitments and I strongly believe it’s why I’ve been injury free for a couple of years now, But Endure24 required more. To up my mileage, I decided to run to Blaydon start line, and finish the race with Catherine for my first ever 100 Mile week. It worked out perfectly. 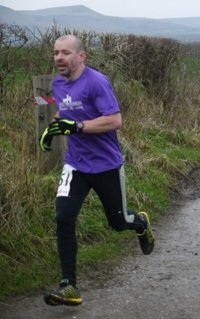 20-miles from my doorstep to Newcastle, then a fun Blaydon race experience. 100 Mile week done and followed up with a 90+ week. I felt good. 2 weeks to go and time to relax, race hard and of course taper. In the weeks before Endure24, I ran a low 17 min 5k at the first Cotsford fields parkrun and set the course record, placed 2nd at a very hilly Gibside marathon in 3:25 and I also placed 2nd at Keswick half marathon, a tough race on a boiling hot day, but what I was most pleased about was 3rd place at Lambton 10k with a 2 min course PB of 35:48. 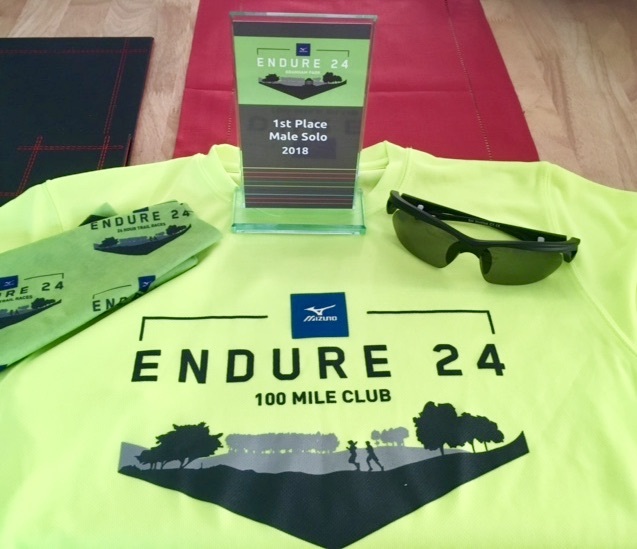 I’d proved to myself I could still run fast while training for an ultra, but the ultimate test was about to come, Endure24 was now one week away. I’d picked up some tips and advice by accident and chance. Chris Callan gave me a Torq apple crumble running gel as payment for a post-Blaydon drink. Catherine decided to order a box of them after I raved so highly about it after a training run. This turned into a total godsend. Another happy accident was winning New Balance vouchers at Keswick half marathon; I bought their 1080 shoes with them. These proved to be perfect for Endure24, with wide toes, comfortable, light and lots of padding. Perfect for churning out the miles and protecting my feet. The 3rd important part was discovering Mountain Fuel, energy system. 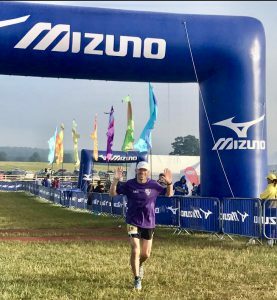 This was after talking to an impressive collection of ultra runners at the Northeast Marathon Club’s Gibside marathon and 24-hour event. So my training started late, a distance PB of 55k, one 100 Mile week and, surprisingly, I felt extremely confident. I felt in great shape. Maybe not sub-16 for 5k, but definitely in good form. I could train long and still felt fresh, fuelling was good and I knew I had an amazing support team around me for the event. The Friday came, car loaded and off we set for Leeds with camping gear, all our food and most of our running gear. The camping area is the same place as Leeds festival; Endure24 is described as the Glastonbury of running for a good reason. We pitched our 3 tents together near the start area and settled in. The race HQ is something special, a massive catering area, beer tents, pizza cooking, ice cream van, mobile coffee van, music DJ, massive banners, and flags flying. A total festival feeling and everyone in such high spirits. I must admit I felt a bit out of my depth, with semi-professional ultra runners strutting about, all the gear, total pros but everyone was great and we soon saw people we knew. It’s a small world the running one, and I love that fact when the nerves kick in. Our goals? Catherine 50, Kerry and Anna to beat last years distance, and for me 50+ with a perfect day achievement of 100 miles. We also wanted to fundraise for Great North Air Ambulance, a great charity, close to our hearts. Anyone who has seen me race will know I’m a competitive sod, I love to race hard and a target or goal really does motivate me. Everyone who achieves 100 miles gets a special t-shirt, so that was my goal. Me being me, I also looked up the course record, 120 miles… just ridiculous. It was forecast to be hot, and it was when we started on Saturday but we were prepared. Factor 50, hat on and all our kit ready. The solo runners have an area to store our food/gear just after the start/finish line. We had packed iceboxes, change of clothes and what we thought we needed. The midday start was great. You had a good sleep and breakfast and some runners even arrived in the morning, choosing not to camp. Pairs and teams of up to 8 were also running as well as us solo runners. This confused and annoyed me in equal measures but again turned out fine. We decided not to walk the route on the Friday. The first lap was supposed to be run/walk easy and learn the route. So, of course, I decided to run the whole thing and stupidly quick. Well into my 3rd lap I remembered it was a 24-hour race and I really needed to slow down. So what does the 5 Mile lap look like? You start on a long grassy straight, not flat. Short gravel downhill, twist sections on gravel, uneven woody climb, and awesome dance party station with energy drink. Hula dance cheer station, more up and downs, uneven ground. Long sweeping covered wood section, amazing checkpoint just before 5K with singing support team and the best-behaved children and best marshals ever. The important toilet and gels were in supply at this station too. Then it opens out to more climbs and grass fields, before a long climb at 7k. At the top, you’re welcomed with the sight of the start/finish area in the distance and a cheeky climb to the end. May not sound it, but it’s absolutely perfect for clocking the miles, I ran the good bits and walked the hills. Every section I soon had my markers as to when I’d start running or walking, and it just made it so much easier. The dreaded relay teams also helped. They whizzed past constantly, so you always had people around you. I was very rarely on my own through the whole event. I had my music and phone all ready to go but never used them once. Another big bonus was catching up with people on the laps; I would stop and take a break with Catherine, Anna and Kerry on the way. This helped to keep me sensible and a check on my mental well-being. After a few laps, I started to realise I was in the lead. The DJ would shout my name out as I crossed the line and I’d try not to look too embarrassed. People must have been thinking who is this idiot going around so fast, just a matter of time before he blows up, clearly has no idea what he’s doing. This was my thinking at the time, but I kept to the run/walk and concentrated on the 50 Mile, 10 lap goal; soon that was ticked off, then 75! With night drawing in, the head torches came out. I loved this change; the pure focus on the path ahead, the sheer beauty of the sunset and the night sky with a giant moon, a total privilege to see. During the night temperatures dropped significantly and I went through some seriously rough times for sure. As Catherine achieved her 50 miles target around 3 am, I caught them up. My memory is hazy but I definitely must have looked in a bad way. I hadn’t eaten anything solid for hours and couldn’t keep solid food down. Mountain fuel and apple crumble gels were all that was keeping me going. A few angry eyes from Catherine & instructions from Nurse Barnett and I stormed off to the catering area for some chips and a hot chocolate, a total lifesaver. I went back out refreshed and still unbeaten, somehow I kept going and the 100 miles neared at 5 am with the sun on the way. 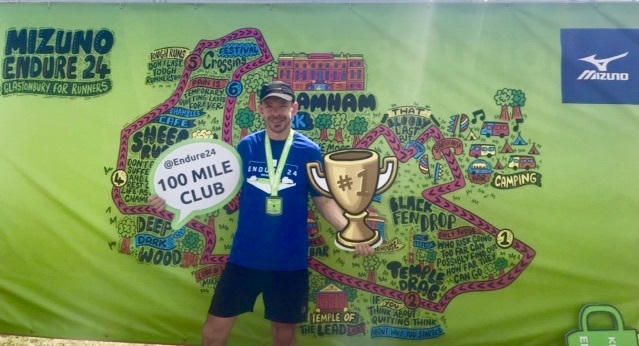 A very special feeling crossing the line knowing I’d just run 100 miles, the DJ was still tucked up asleep and it passed in silence but inside I was dancing. Catherine was there to capture the moment, I was fully winter running clothed and looked beat up, it had been a hard night but I’d done it! I’d hit the target, scored the sought after tee shirt and could tell everyone who had sponsored us I’d achieved my ultimate goal! As the sun came up I changed into shorts and t-shirt, put sun cream on and started to feel human again, I wanted to keep going. Catherine was awesome, supplier of hot food and various treats she pulled from the cool boxes. Rob, Kerry’s partner also helped with a surprise chocolate ice cream and the coldest best cola drink ever when I really needed it. On my 110 Mile lap, I started to realise I could really win this thing and go for the course record of 125 miles. I was still running ok, everything hurt but I was getting used to that. I worked out that if I ran a decent 115 and 120 lap I would still have 1h30 easy for a victory lap with Catherine. So that was it, head down and ticked off 2 sub hour laps with 120 miles done. Refreshed and ready with Catherine, we started – lap 25 for me and lap 11 for her. It’s hard to put into words just how special a moment this was. The pain of every hill. The stopping and starting. Everything hurting, but never once did I think of giving up. We thanked everyone on that last lap and the cheers at the end were amazing. Kerry captured the moment perfectly. 125 miles in 23 hours 21 mins, course record and I was not quite broken, even though it was a distance PB of 90 miles! 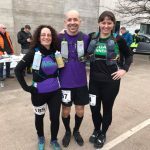 Catherine achieved a distance PB of 55 miles with more in the bank for sure, Kerry achieved a fabulous 60 miles, distance PB and Anna achieved an amazing 90 miles, distance PB. A truly special event, exceeding all expectations. Will we all return? Some of us definitely will, it’s back to the short and fast for me, but you never know. I’m happy to report Ultra and speed can survive together. 3 years ago I struggled to get a team together for this relay, 4 lonely excited Striders competed that day and I’ve been struggling ever since to get us back. This time it was different. 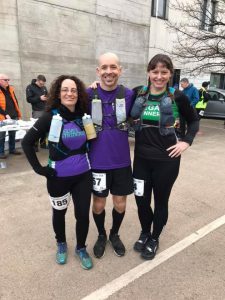 With a 50/50 split between old and new Striders in the team, we headed down to Manchester and into the unknown for all but myself. 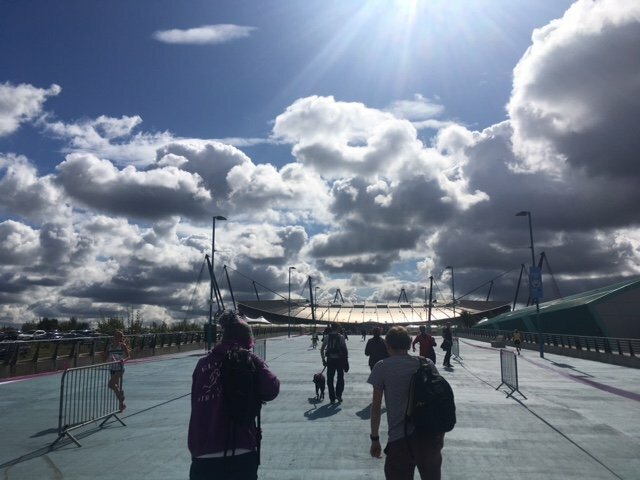 The excitement was in the air as we walked over the bridge Towards the Etihad Stadium and sport city complex. Some incredible fast youngsters flew past us on the way to registration as they raced round on their relay leg. This set the tone of a truly top end competition and a sense of home coming for myself. Sport city was developed for the 2002 commonwealth games, the facilities are incredible. Registration was inside the main building leading to the outdoor track, job done and I was face to face with something completely new to me. 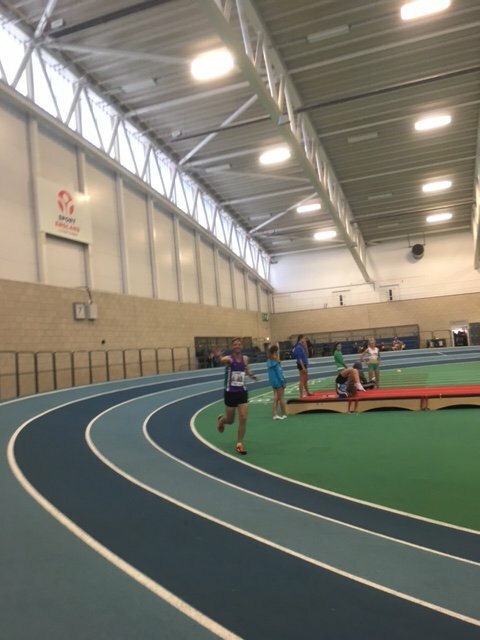 A 200m indoor running track, looking round at the excited Strider faces next to me we all had the same thought, wow this is amazing. We found our base station round the track and planted our purple flag with pride. This required quick thinking as no grass, thankfully Mark Warner had a spare pair of shoes and laces to do the job 😄. pictures and Facebook post done, the team soaked in the atmosphere. 100+ teams from the north are represented consisting of their very best best runners. All hoping to qualify for the national road championships. Top 25 is the standard and the dream, but I knew it was a massive achievement for Striders just to field a competitive team. The positive chats and feedback have been amazing from many of our local clubs. They were all pleased and quite shocked to see us, the feeling of pride was really overwhelming. Onto the running, each man gave their best which is all I ever ask. Each had their battles and all had that massive grin on their faces as they walked back to the strider area. Chris Callan was the first leg, the excitement of starting on the track next to 150 amazing runners did nothing to distract this dedicated runner. Set off at a solid pace and consistent splits showed what a rising star he will be for the club. A solid start and strong run. James Lee shot off on the second leg, the hand overs are just like the Durham cathedral relays and well organised. A good leg from James with his distinctive style sprint finish and 100% effort. James was A last minute stand in for the relay and I’m massively great full for him stepping up. Mark Griffiths was next, another new strider and showing massive potential with a fast run only 3 seconds behind the flying Chris. I have no doubt Mark will continue to get ever quicker and had some amazing flying feet pictures on the day. Mark Warner running 4th, was massively exciting to watch as we were clearly mixing it up in the middle of this incredible field of runners. Mark ran with dedication and a impressive continued return to form. I decided to run the last leg, I hunted down a few people and loved the excited cheers from the team as I charged down the home straight. 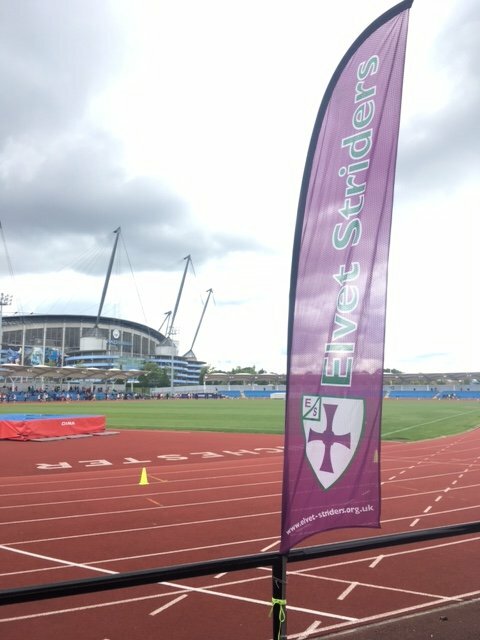 The course takes you looping round the outside of the stadium, round the sport city complex then finish back on the track. The heavens opened during my leg but happy to even pace and play my part. The strider team officially placed 55th of the day out of 103 complete teams. Some teams being disqualified and some were incomplete. We all enjoyed a nice cold beer on the way home and reflected on what we had just experienced. So what did we think? Wow is all we could say. 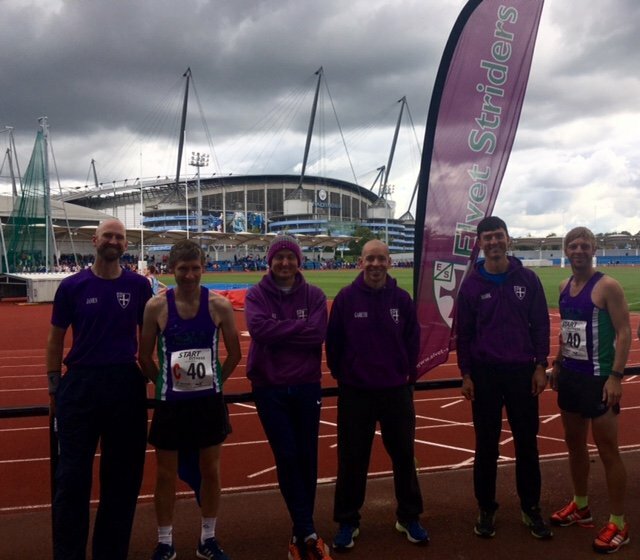 For the first time Striders had fielded a complete team and we didn’t just show up, we were competitive with the very best the north had to offer. I felt proud as we chatted about the day and the possibility of doing it all again. A truly amazing experience and something I can highly recommend to everyone in the future. So next stop will be 25th march 2018 when I will try once again to get a 12 man team together. An even greater challenge, but definitely worth a go. Would be even better if we could field a ladies team too. Can it be done? After today I think we have a chance. 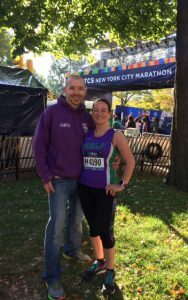 In November 2016 I completed the NYC marathon in a time of 2h56 and left New York a changed man. I am writing this report 3 months later (it’s never too late) this is my story and the birth of team Smitchard. I decided not to run a marathon in 2016 as I kept getting injury problems due to the demands of training. Anyone who knows me will know I race hard, always pushing my limits and love seeing how high I can reach. I started 2016 unable to race and dreams of marathon running gone from my mind. Someone mentioned I already had the required entry time for New York of 2:56. So on a quiet night shift I decided to enter the ballot (assuming I’d never get in) and completely forgot all about it. 4 months later I got my acceptance email from NYC road runners and I was in. I had never been to New York or American so this was too good a chance to miss. 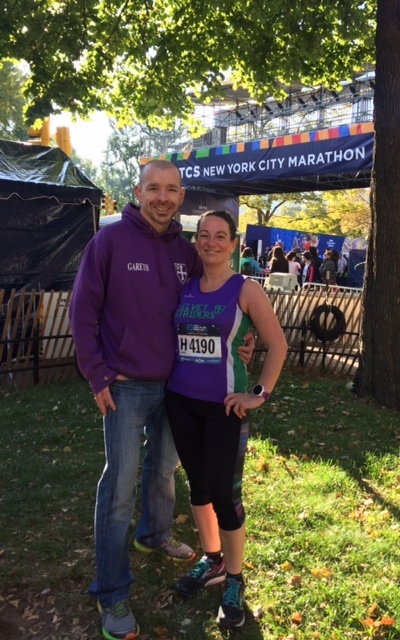 We started our plans for a 6 day New York holiday and contemplating just how I was going to get to the start line fit and in injury free. Big thanks go to Allan seheult and my amazing star supporter Catherine Smith who sacrificed massively along the way and helped make NYC happen. What an amazing city and what an amazing race to take part in, hopefully this will help any striders looking to run this in the future. Pre race Lessons learned? It’s a long day, the pickup is 6am, a long bus trip, massive airport security style checks, baggage check in times are very tight and close early. Then you have a long wait in the starting pen before you start. I just about got my bag in on time then stood in the pen for over an hour getting very very cold. People had old sleeping bags and all sorts in the pen, definitely worth thinking about. Catherine ran the last 5k of the marathon the Day before in the dash to the finish event. A really nice race and helped build the excitement leading to marathon day. We also flew the British flag in the opening ceremony after being selected on the Friday too, was great meeting fellow brits in the big apple. With a qualifier time and a front pen start I expected a smooth easy start to the race. Unfortunately something went wrong with the pens and instead of an empty road the first pen met a wall of selfie taking fun runners blocking the narrow bridge for the first 2 miles. I admit I panicked and started weaving my way through the crowd and using up precious energy on the way. I got to half way just over 1h20 and I was serious struggling, after fighting with cramps and an emergency toilet stop I knew from experience that my race was done. So at 15 miles I made the hard decision and focus on keeping it together and finish the race hopefully sub 3 hours. A massive achievement in its own right. As I entered 1st avenue I started looking round for my star supporter but the crowds were mental and it was almost impossible to see anyone. I later found out Catherine did see me fly onto 1st avenue but road closures made it almost impossible to travel on the day. Manhattan is not flat, New York is not flat and it’s a blinking hard marathon but the sights and sounds along the way are out of this world. Truly an amazing experience running these iconic streets, the fans are so loud and supportive and offered food along the way. At 20 miles I was dead on my feet and eating everything I could get my hands on. Another tip:- they have water and Gatorade in the same looking cups at each station. When your tired and punch drunk is easy to get them confused, resulting in me dumping sticky Gatorade over my head. The cramps and pain were almost unbearable towards the end and something I’ve not experienced before. Best feeling ever when I spotted Catherine in the stands shouting for me as I dashed to the line, despite fighting off the snipers attacking my legs. It’s was a long walk after the finish till I finally saw Catherine again and things at last sunk in. On that day I was followed by our amazing club using the tracker app, I believe it made for interesting viewing as the app finish predictions went from sun 2:40 to 3 hours plus along the way. A big thank you for the support, it really helped and made my day. The most important event ever happened to me in New York, but it was not the marathon. The marathon was amazing, once in a life time and I will remember it forever, but that is not why this city is so special to me now. It special because Catherine Smith made me the happiest man alive, after dragging her round half of New York, over the Brooklyn bridge just to meet a strange lady to take ore photos in the beautiful park (all part of my proposal plan, unknown to her ) she still said yes and agreed to be my wife. Captured forever in some amazing photos and a spectacular city. New York Saw the birth of team Smitchard and made me the happiest man alive. The sub 2:45 dream can wait for another day, some things are more important than running. In my head, Blaydon 2016. A very personal view. Running well. Feeling good. Pre race 17 min durham parkrun pb. Reality check at club track mile race on Wednesday. 2nd place strider last year. Wanting to be competitive this year. Please let it be close. Massive doubts. Deep breaths. Catching up with strider friends. Feeling relaxed. Squashed in at the start. Stood like sardines for 20mins. When will we start? So many people, 4000+ runners with 100+ striders. Feeling very northern at the Blaydon start line. Down hill start, must start fast, must be leading after 5k, please don’t let it be close with 2k to go, I won’t stand a chance. hoping club member achieve their goals, where is Catherine? Can I really push myself that hard at the start. Stick to the plan. Concentrate concentrate and relax………. Was that the start horn? Go. Zero to race pace in a flash. Find some clear road. This is nuts. Accidentally barge people out the way. How did they get so far up the field? Control ur pace Gareth but push push push. It’s down hill, push. 1k @3:21, fast but need to pick it up. Be brave. Get that gap, get that lead Gareth. I know that runner? Yes, hi mate. Looking good, wrong way man? Yes that’s my Washington 10k bud. So glad he won that day, now show him your true speed. Help I can’t breath. Push push push. K splits 3:13. 3:16. 3:17. 3:13. Can’t breath. 16:19 5k omg. Keep it together. Relax, maintain stride, don’t look back, you have your lead. Hope it’s enough, I want to stop. I know him? Push past and say hi just. Expect them to try keeping up as you pass, just push harder. I know the hills are coming. Don’t look back. Turn, then dash back up the hill. Time to see who is close. Where is he? Please don’t be just behind, I need a gap. I’m slowing. can’t see them. Yes yes yes, still can’t breath but I have my gap. Surely he can’t catch me now. Still passing people. Spot More striders running. Try to say something, but I can’t breath. Fly over ahead. Pushing and still passing people. Getting so so hard. Big shock on the coaches face. Into Blaydon, I know this course well. Keep pushing Gareth, you got this. More surprised strider supporters. So happy to see familiar faces. Hold it together, push. Last hill, know it’s coming. Grass and sprint to the line. I did it. Check watch, 2 mins off last years time. Definitely First strider home. In disbelief. Taken down Rosie, just. Turn and support. I love this race. That was hard. Now I can breath. 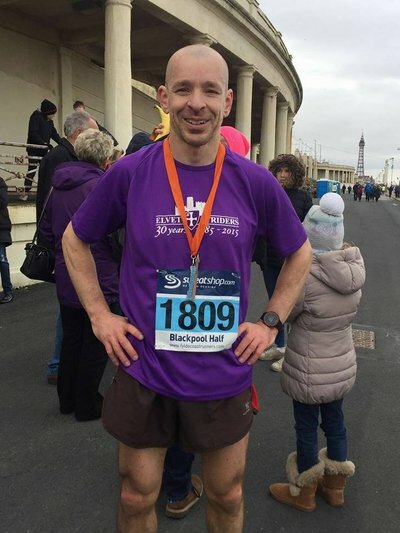 This is the 2nd time I’ve raced at Blackpool but my first over the 13.1 miles distance. It’s a good 2 1/2 hours drive away so requires a hotel stop a large commitment to do it justice. My road to Blackpool started last year when my body fell apart in the build up to the Yorkshire marathon for a second year. I decided after that big disappointment, committing to a marathon again the following year was not for me, instead I decided to make 2016 a racing marathon free zone to allow for some real speed work and recover from the demands marathon training requires. A surprise come back 1/2 marathon PB at brass monkey was the boost I needed, so I started looking round for a fast flat 1/2 that I could target. Due to work and other commitments I was left with Blackpool as the best option. A course I sort of knew after racing the 10k there last year, the dates worked and the chance of making a weekend of it meant it was the perfect choice. So with the help of our club super coach Allan, we drew up a training plan with Blackpool being the end goal. It was based on the marathon program but allowed for exciting distractions and other races along the way without the pressure that the formal marathon program brings. 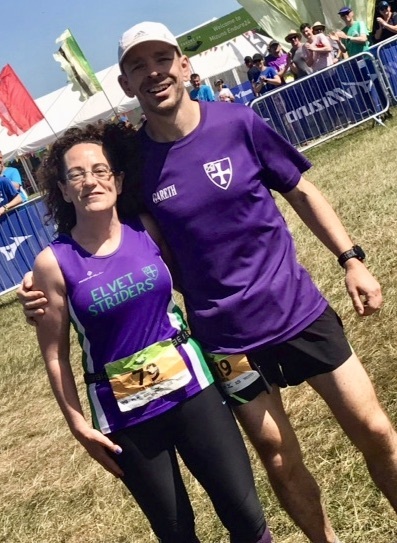 One such adventure being the kielder dark skies marathon with my secret training weapon and number one fan/coach/supporter and most colour coordinated strider, Catherine. I strongly believe the long and short runs we have done together have helped improve my running in countless ways. This is something I would never have done before, heading out for a run well below my slow calculated recovery pace or spending 5 hours 10 mins time on feet round kielder. 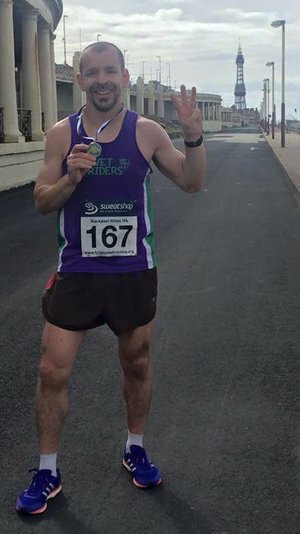 Training had gone really well with a sub 17 Sunderland parkrun and a 10k PB at the sand dancer in the build up. With a current 1:17:30 pb I was hoping for at least sub 1:17 and ideally a top 3 finish if the last few years results were anything to go by. But as always it depends who shows up on the day, as the coach said, concentrate on my running and the race result will take care of itself. I felt really relaxed at the start line, confident and waving to Catherine who was still suffering from the kielder race and had to pull out of the 10k also on at the same time as the half. The target pace was 5:50 min miles but I knew I was capable of more if I felt good. So after the first couple of splits at 5:30 and 5:34 I tried not to panic too much. I deliberately slowed my pace but still well below goal pace. What worried me was how far back I placed in the field, only just top 10 after 4 miles and the leaders well ahead. 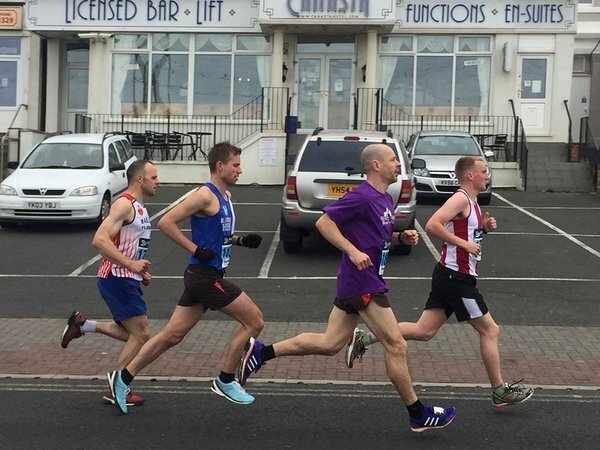 You run past all the Blackpool piers, to to the roller coaster then loop back past the start at about mile 8. This is when the fast pace, slight climb and wind started affecting me. Thankfully I had Catherine shouting me on at this point from the tram tracks sidelines and I snapped back into life. I had slowly picked my way back to 5th after dropping the 6th place runner who wanted me as a wind breaker. 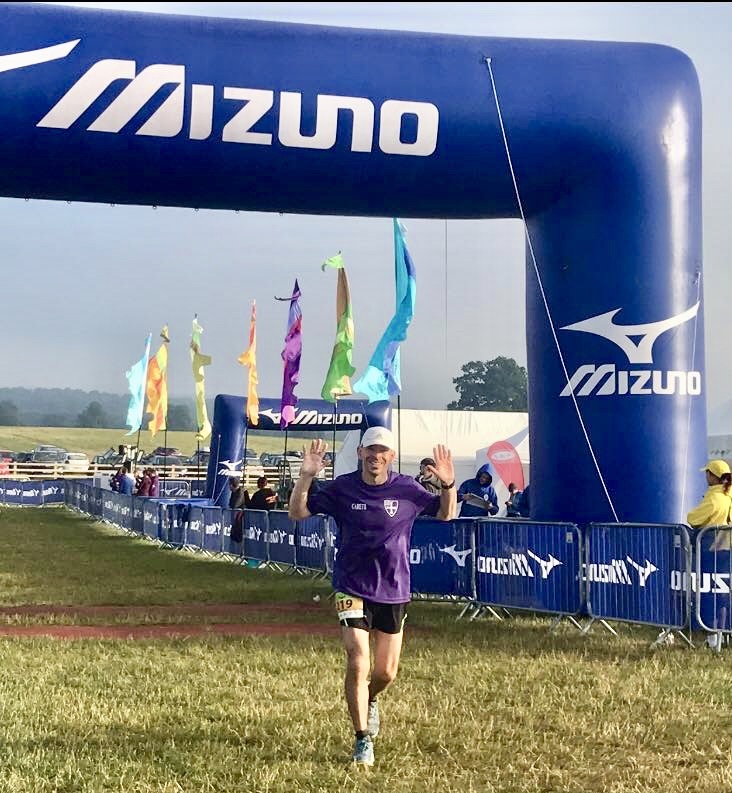 The only time I clocked my race time was at the 10 mile point – it read 58 something which was a really pleasant surprise (shock). Either side of that I just concentrated on trying to close the gap to the next runners. The last 3 miles were back along the coast, away from the wind and 3 miles of mad racing I won’t forget any time soon. The feeling was amazing as I caught 4th 3rd then 2nd placed runners and just kept going. This last 5k was the fastest of the race for me and a total dream. As the finish line came into sight I knew 2nd place was mine and the joy just exploded as I did a crazy hand dance to the end. My number one supporter cheered me home and I had some how achieved it, 2nd in a major half marathon race. Only then did I check my watch which read 1:15:15. I just assumed it was wrong and still did not quite believe it till the official results come out online. For me this was the perfect race with a fantastic flat course, a really good training plan and the best support from so many people within our club. A special feeling I felt privileged to be able to share with them all. The only slight disappointment came with the prize for 2nd place being another t shirt and that’s about it. Nothing for the mantlepiece, nothing to display leaving 3 very confused and disappointed runners at the so called ‘prize giving ceremony’. A shame after what was without doubt my best ever race and a running highlight I may never top. Now onto the next challenge….. This was a very different racing experience for me, fast flat road running and PB hunting is all I’ve ever trained for. I’m the first to admit that fell and mud running is just not my bag. I hate the constant stop/starting, sliding in the the mud, kit list, carrying kit, worry about correct shoes, getting lost, navigation, walking steep sections, and being completely unable to compare one race to another. This is just a small list of the preconceptions which I held before the race which thankfully I no longer hold due to first hand experience. Entry on the day was very easy and people soon started talking about kit you would have to carry and kit checks which made me panic as my kit consisted of a running coat, cheap fell shoes and that’s about it. 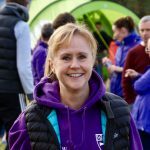 Thankfully when I was watching people slowly gather and talked to other more experienced striders I soon realised I could ditch the coat and warm up best I could before the race. Pre race strider photo call done, it was time for a quick pre race catchup and getting some info on what I had let myself in for. 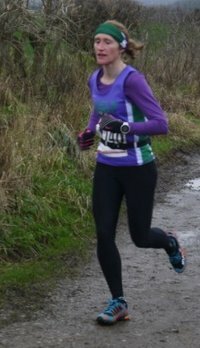 I’ve been struggling with injury problems for the last 3 months and this was my first race back. Feeling heavy and not in the best shape I was not expecting much and was just hoping to not embarrass myself too much. I’ve decided to try some different things for this year and captain cooks fell race seemed like a perfect start. Conditions were wet and very muddy, but the predicted black ice did not show, so my shoes just about did the trick. The start is fast and felt like a road race for the first mile but wearing the wrong shoes. Then the hill slowly hits, then the monster mountain knocks you out. I’m sure this is normal for fell running but I’ve never experienced pain quite like it. You have no option but to walk it’s that steep, and even constant walking was almost too much at times. We slowly peeked at the captain cooks monument and then the mad crazy dash down the muddy hills begin. I’ve always been OK on down hill but my legs just would not recover. I slowly picked the speed up and even passed a few people on the down hill. Then the true fell runners flew past me and I was left in awe and eating their dust. Truly a different species and something very special to see. The last section was again more like a fast road race which felt good to me, then a quick XC mud dash and sprint to the line. All over in a painful flash and confused blur as somehow I’d just managed to keep things together. It’s hard judging your race time in an event like this but most seemed pleased with their runs. A few got lost on the top, a few bumps and falls too. With Thomas Reeves sporting the most cuts closely followed by Catherine Smith. We all retired to a local pub for some much needed food and refreshment. Some great performances and a really enjoyable way to start the new year. A well deserved 2nd place for the elvet female team and a respectable 6th for the men’s. Definitely something I will try again. Being a fan of tarmac and intolerant to both hills and mud I never really considered attempting a fell race. And then I was presented with potential of the Captain Cook Race which was on New Years’ Day when let’s be honest, most of us are a little worse for wear after feeling obliged to stay up late the night before, drinking. After several wonderful reports on this ‘little, punchy race perfect for beginners’ I somehow agreed. On the morning of New Years’ Day I suddenly felt a little nervous. 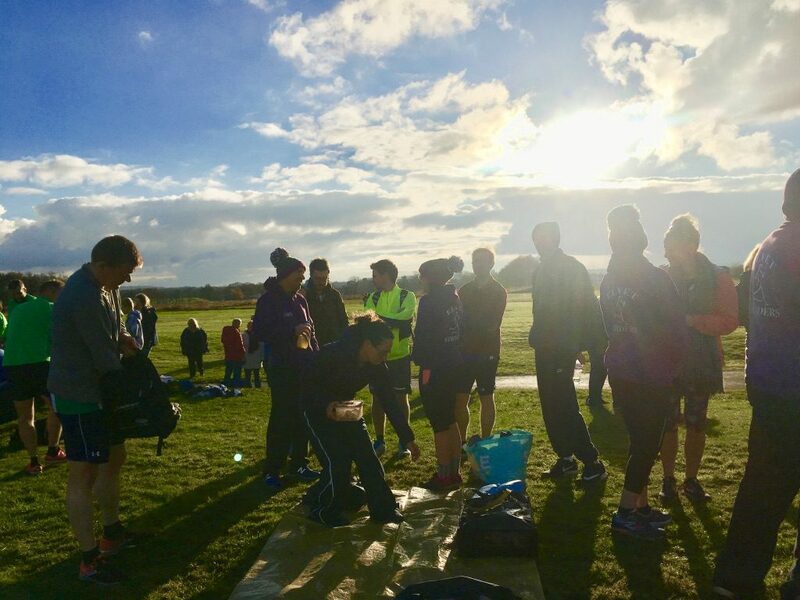 I had no idea what to pack and so after being told I needed no specialist equipment, threw three outfit changes, several pairs of trainers, a packet of baby wipes and a chocolate milkshake into a ruck sack and set off in pursuit of my first fell race. As I was picked up by a bunch of hardened and experienced fell runners (Penny, Paul, Tom and Joan) I got the opportunity to ask lots of questions but still arrived at the destination full of trepidation. 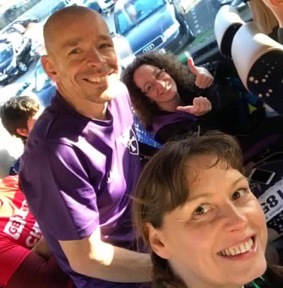 The Royal Oak pub was filled with serious looking runners and plenty of friendly faces wearing purple though I was then informed at registration that I needed to carry a waterproof jacket during the run as minimum basic FRA equipment. Steph Piper came to my rescue with a spare bum bag, waterproof jacket and whistle which then left me able to continue. Right on time, at 10:55 we assembled across Great Ayton High Street, somewhere close to where the imaginary start line would be and after a minute or two worth of instructions about ‘being careful on the black ice’ we were off, en masse in the direction of some very large hills. I started slowly making sure I kept lots in the tank for whatever presented itself but it was clear from the start this ‘race’ was going to be nothing like I’ve ever done before – my two previous favourite run events being the GNR and Blaydon! The run started with a relative gentle upwards gradient first on road and then more onto a trail-like track becoming narrower and narrower until it was quite quickly a single file traffic event running up the side of a progressively steep hill, the top of which was not yet apparent. The next 1.5 miles involved no running at all and were essentially a battle against the laws of physics with me scrambling up the side of a very steep hill (mountain’) trying to reach the top in as dignified a manner as possible. Jan Young was a welcome sight halfway up the ascent, shouting positive comments to spur us Striders on. I was also aware Mandy Dawson was right behind me and so my ego kept me going, upwards. Oh what a sight the summit was”.. It was like a game of two halves with the next part being all of the fun. After 100m of flattish track the path went sharply down and I suddenly seen the pace quicken though this was nothing like I was used to, not even with a couple of XC events behind me as experience. This is where the seasoned fell runners came into their own and a couple of incredibly fast men came almost literally flying past me down the side of the mountain. And so I attempted to join them and leaving my inhibitions behind went as fast as I could through the mud, bog, bushes and uneven ground, downwards towards the village, just about managing to curb my desire to shout like a child as I went. The terrain flattened though the mud remained and I almost lost a shoe to it. 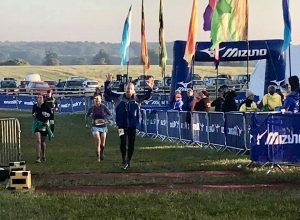 Once I’d arrived back on solid, flattish ground, and knowing the end couldn’t be much more than a mile away my confidence picked up and I then started to ‘race’ in the sense I previously understood. The end was incredible with a good sprint finish to prevent the guy behind me from winning and then I was met by a sea of friendly faces at the finish line (again imaginary) and many Striders, either spectating or already finished ahead of me. Including Tom who had seemingly hurled himself of the side of the mountain and was sporting two bleeding hands, two bloodied knees and a large graze up one thigh, shorts ripped. Though he’d incredibly spared the pink bum bag he was wearing! As confused as I was about whatever had just happened I very much enjoyed this run and would definitely consider doing it again next year. All the money raised from this event (£2108) goes to charities. 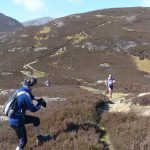 There’s more information in the Esk Valley results and race report – Ed. On the same day as our local Great North Run 7,215 West Country runners stand ready for the half marathon challenge. 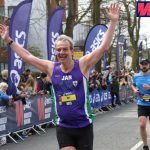 I have been struggling to beat my Half PB of about 1:22 for a while now but I’m in good shape and deep into marathon training so the signs were very good. 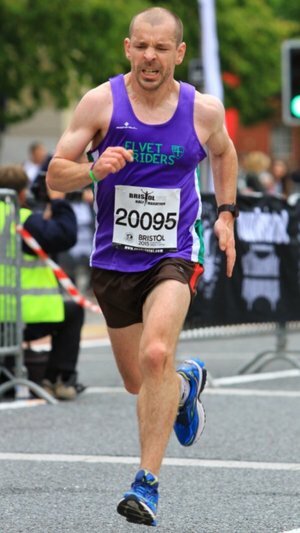 The Bristol half is a great course, flat in the main and a large crowd to cheer you on. You pass under the impressive suspension bridge twice and get to see some nice parts of the thriving Bristol harbour area. Well organised and supported, I would definitely recommend it to anyone looking for a alternative to GNR that happens to be in the area. Now onto my little half marathon story. I knew I’d be able to do 6 min mile pace over 10 miles but over the half marathon distance would be a big challenge but possible. I knew it would be very painful but at least possible one day with the right training and good condition, so that was my goal pre race. The first few miles were spot on for pace and I was feeling really good at the 4 mile turning point. My dad was also running today with a sub 2 hour goal so was a big buzz seeing him running so well on the other side of the road as we passed and shouted each other on. Pre race research meant I knew the half way point was near the suspension bridge and started to race hard as I picked people off. It’s an odd feeling to be passing people the whole race, but that’s what I did with ease and felt great. My marathon training was really paying off but the pace did drop slightly from mile 9 to 12 and not much I could do as my legs started to get heavy. I had zero taper leading into this race as it’s not my end goal so it was sort of expected. Even dropping 10 sec or so per mile I was still passing people, so still very positive. I had a good race for the last mile with a local lad which kicked me back up to speed and blasted past him down the home straight as sprinting hard to a big PB. 1:18:55 for me and well under the 2 hours for my dad, so a great days running for the Pritchard’s and that 80 min barrier well and truly smashed. Not quite the fastest strider yet but at least I closed the gap, job done. I suspect my next half will probably be brass monkey next year. Now it’s marathon time yet again, York here I come. The course is very much like the Hartlepool parkrun, perfect for fast racing. The wind was blowing along the sea front on my warm up as I started to see the fast lads gearing up for the show. From last year’s results it looked like 33 min’s for the win and maybe 36 for the top 10. So this was my goal with maybe an outside shot at top 5 if things went really well. Training was going fantastic due mainly to the coach Allan and my 2nd number one supporter at home. I felt in fantastic shape and really relaxed going into the race with a 35:30 PB only a few weeks ago at Darlington. A quick chat with some fast lads on the start line confirmed it was going to be a very fast and tough race ahead. The 1st mile loops back to the start and I got a massive shout out from my strider support star. Pace spot on, just about in reach of 5th place runner, a dream start and feeling good. The next few miles I raced hard and soon found myself running shoulder to shoulder for 3rd. The pace was way too fast to sustain but decided to keep at it and hope I slowed less than the lad next to me. Mile 3-4 you turn back and are faced with a few challenging hills. The pace slowed but thankfully a bit of distance started to form between me and my racing shadow. The last mile was ran in a state of shock and fear as I’ve never placed in a serious road race before and desperately hoping to hold it together.